My little frog prince is cut out and set on foam blocks to give the whole scene a bit more dimension. I put some small crystals on the crown. You can get the sentiment from High Hopes, but I didn't have it, so I created my own on the computer and cut it out with Spellbinders Nestabilities Labels 1. Mein kleiner Froschkönig ist ausgeschnitten und auf Abstandshalter gesetzt für mehr Dimension. Ich habe kleine Kristalle auf die Krone gesetzt. Ihr könnt den Text bei High Hopes kaufen, ich hatte ihn aber gerade nicht bei der Hand, also habe ich ihn am Computer erstellt. Danach habe ich ihn mit Spellbinders Nestabilities Labels 1 und meiner Cuttlebug ausgestanzt. 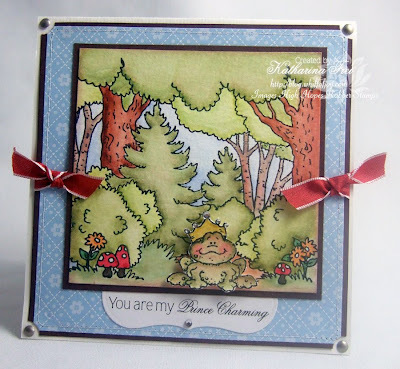 Paper: Su cardstock chocolate chip, dp "Washington Apple"
Beautiful scene creation, love the little prince and matching sentiment. Fab colours! So cute, love the frog! Beautiful card Katharina, I love the forest background, I did wonder if you put it all together individually. Love that sentiment too, the nestie shape is a great finish! 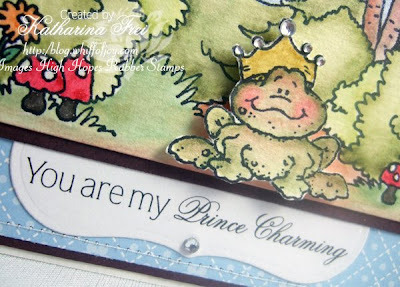 So cute card and pretty prince!! What an amazing and cute card! I totally love it!! Adorable card. Love all the scenery. How sweet is this...such a cute card ,coloured beautifully! WOW! That is gorgeous, Katharina!! What a wonderful scene, and so cute! Oh, Katharina, this is adorable!! I had something similar in my head, which of course I haven't gotten around to doing. Now I'll have to change it up a bit, lol!! I just love the froggie...he's the cutest I've ever seen!! Katharina what a gorgeous card! Your scene is amazing! SO pretty! The scene is amazing!Love the frog and FANTASTIC coloring! Fabulous love the scene you created! Wow, was für eine tolle Karte, traumhafte Coloration - einfach WOW! Lovely scene! I think I need to kiss that prince charming! It looks so Disney that I feel like a princess in a fairy tale just by looking at it.